Research commissioned by the Congressional Institute shows that almost 60 percent of Americans believe that Washington does not hear them. What’s more, Americans also believe that Members of Congress, rather than the President, media, or citizens themselves, are most responsible for ensuring that the government hears the public. To meet these citizen demands, Members of Congress and staff must continually strive to remain close to all their constituents and to open Washington to constituents—no small feat. But it is possible, and some deliver admirably. 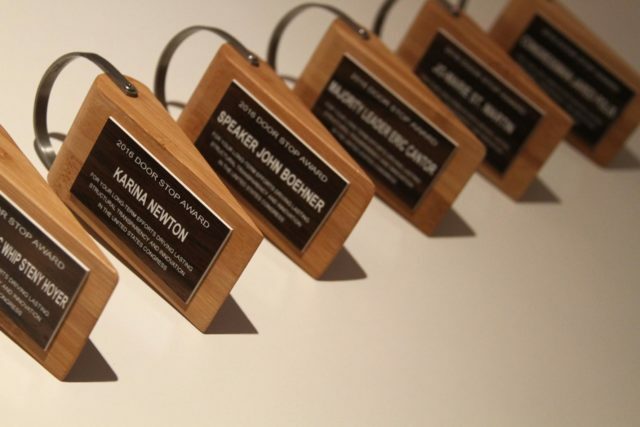 As the name suggests, the Door Stop Awards allow the public to honor Members and their staff that succeed in creating open, transparent dialogue. If you know Members of Congress or staffers who have innovated or promoted open governance, nominate them for a 2017 Door Stop Award. You may submit nominations online: http://bit.ly/DoorStopNomination. Winners will be announced at an event on May 17, 2017. To RSVP for the 2017 Door Stop Awards, click here. For more info on The OpenGov Foundation, click here.